Just two looks I did recently. Not a whole lot to say about them besides I love duochrome shadows! Can't get enough. Always looking for more. Duochromes are my weakness. Can you see the color shift in both colors? Blue-green on red-brown and gold on green. Like seeing a butterfly or a moth wing up close. MAD Illusion is pretty much identical to MAC Old Gold. For some reason it seems more duochrome than the MAC, but then when I hold them side by side they seem the same. I think my mind is playing tricks on me. Maybe the smaller jar exaggerates the duochrome effect. I took a lot of pictures of this one to try to show all the different colors. There's gold/yellow, green, brown, red, black, orange... It keeps changing depending on the angle. Man, I love duochromes so much. I adore the second look - beautiful! I hear Persephone Minerals on Etsy make lovely duochromes. oh i love love love the second make up! Nice! 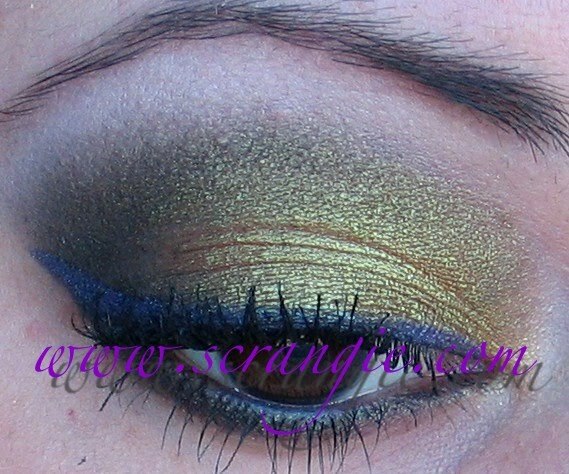 My favorite duo chrome shadow is HIP by Loreal Intrepid pigment! Its just too awesome! you should get it! Would you please do a tutorial on how you do your eye makeup? It's always so perfect and I can never make mine look this good! thanks!! I love MAC's Blue Brown pigment. I wore it today and now you've inspired me to use it more! Both of these looks are so gorgeous! *. * I recently got TF Shadow insurance because of your recommendation (chose it over UDPP) and am lovin' it! Nice. I love MAC blue brown. I usually pair it w/ MAC Club e/s. Mas sigo este blog porque acho tudo lindo !!!!!!! Wow, pretty!! Especially the second look! Wicked is LOVE! LOVE LOVELOVE. Whoa, duochrome! That looks cool! I love duochromes also. Whether there on my nails or eyes. Lovely eye makeup. FAAAAAAAAAAAR out. That first one is to die for!!! I gotta learn how to do that. Srsly. :0! Meow Kitty Litter is brown/chartruse (sp?) one of my faves. Also Petal Pusher from Too Faced...brown/light blue! er, correction. Petal to the Metal, you'll luv it!